The NVT Phybridge model NV-16PS10-PVD combines a 1 Amp/channel power supply with pass through video and telemetry data, for up to 16 cameras, all over UTP wire. 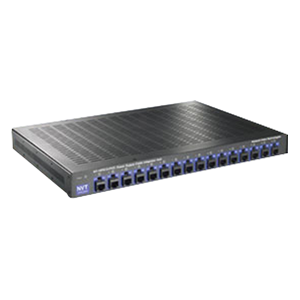 Designed for installation in the wiring/IDF telecom closet, or at the Control/MDF room, the NV-16PS10-PVD consolidates connectivity via standard 4-pair RJ45 EIA/TIA 568B compliant premises wiring and pinouts. At the camera, Power, Video and Data connections are made using a PVD™ transceiver via an RJ45 connector and a single 4-pair cable. Control/MDF room connections are achieved with a single 4-pair RJ45 cable for each group of four cameras. Consolidated P/T/Z telemetry data, if required, passes through the NV-16PS10-PVD’s data path, and is connected to the controller via another 4-pair RJ45 cable.